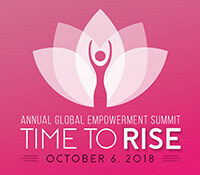 The 2018 Annual Global Empowerment Summit "Time to Rise!" encourages everyone to become a global change maker! All are welcome to attend this free, public event at UC San Diego Qualcomm Institute in Atkinson Hall. Summit attendees will explore topics, such as the power of collaboration, social impact, global connection, human triumph, recognition, and the power of collective minds as a means for solving worldwide social issues, like human trafficking. Representatives from local, national, and international think tanks that fight human trafficking will share their knowledge of this critical and growing problem. The summit will include several prominent local speakers, as well as global presenters from the United Nations and the World Bank. There will be a vendor fair, mini market place, and international food catered by survivors of human trafficking from different countries. Now in its third year, the most significant impact of the Annual Global Empowerment Summit has been mobilizing local and global change makers. We believe dedicated people working together on issues of common concern can find pathways to change and build better, sustainable communities that care. This creates a compassionate foundation from which we can build a better world. The day’s panels and speakers will encourage cross-cultural understanding, instill a strong sense of dignity and acceptance, promote problem solving, open doors to economic opportunity, and allow healthy growth within for all involved. REGISTER HERE and visit SocialImpact.ucsd.edu for more information.